Russian navy ships left Vladivostok on Wednesday for Shanghai to take part in a joint naval drill with the Chinese navy in the East China Sea, billed as a massive show of strength for the two allies. Six ships from the Russian Pacific Fleet would take part in the “Joint Sea-2014” drill in the northern part of the East China Sea which coincides with the crucial China visit by Russian President Vladimir Putin next week. 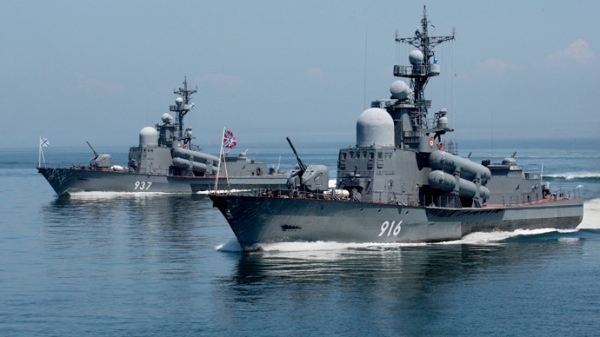 These include the flag ship of the Russian Pacific Fleet, Varyag, anti-submarine ship Admiral Panteleyev, amphibious ship Admiral Nevelskoy, anti-surface destroyer Bystry, tanker Ilim and tugboat Kalar. Russian officials have said the drill is aimed at strengthening mutual trust and cooperation between the two countries’ military forces, and boosting their capacity to jointly deal with maritime security threats. A total of 14 vessels, two submarines, nine fixed-wing aircraft, helicopters and special forces from both countries will take part in the exercise, a Chinese navy spokesman said in Beijing on Tuesday. This will be the third such exercise after joint drills off the coast of Russia’s Far East in July 2013 and the Yellow Sea in April 2012. Meanwhile, Russian President Vladimir Putin is expected to sign a range of agreements with his Chinese counterpart Xi Jinping in Shanghai next week.